Classified » Business & Office » Businesses for Sale » Big Dreams And A Small Budget? That's why we are here to fulfill your dream!! Budget-Friendly Promo for Office Carpets ends soon! Take advantage of this now. It is the lowest price in Malaysia!! isn't it? 1.Insulation: Carpet can help save energy as it is an important contributor to the insulation of the indoor environment. Carpet insulates floors as it provides a psychological feeling of warmth. 2. Feel: Try curling up in front of the fireplace on a hard surface floor. Carpet feels good, soft, and easier on the feet. It also gives a "softer" feel to the home. 3.Safety: Invariably, slip-and-fall accidents occur on hard surface floors, not carpeted floors. 4.Cost savings: Carpet usually costs less over time than hard surface flooring to purchase, clean, and maintain. 5.Health: Carpet traps allergens, dust, and other contaminants, holding them until they can be properly removed. 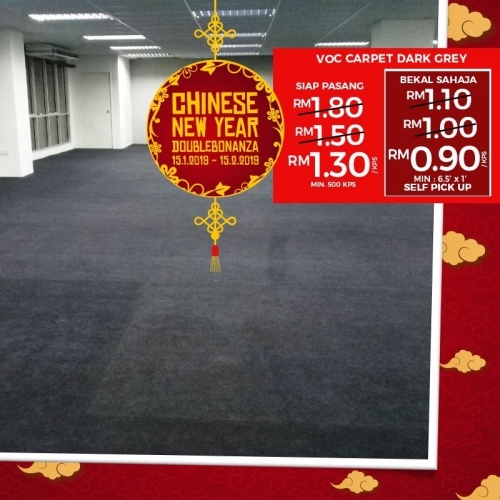 Not only we offer the cheapest price in Malaysia, but also our expert will help you find the right flooring and they'll make installation easy.